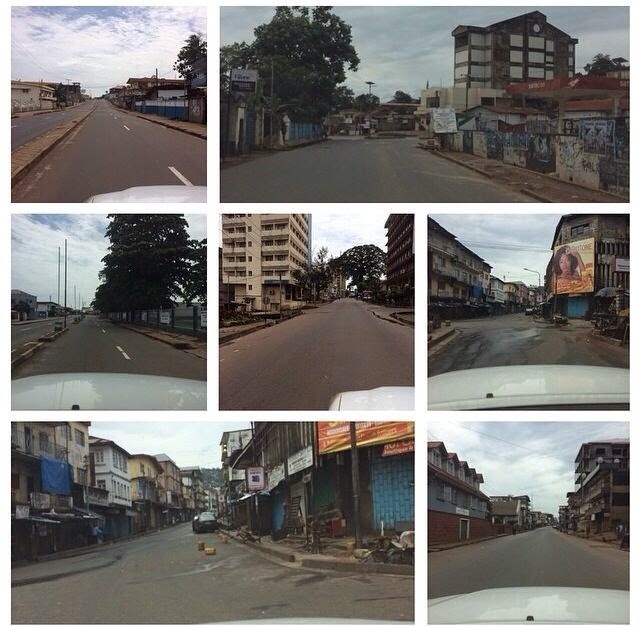 Anyone who has been in Freetown will know that empty streets like this are highly unusual. I am not sure if I have ever seen the streets this empty. This past Monday, the 4th of August was declared a "Stay at Home Day" by the President of Sierra Leone. At the time the President made the announcement, no one really knew what he meant. So what did it mean? Basically, almost every citizen in Sierra Leone stayed indoors that day or at least on their own compound. Meanwhile health workers and volunteers went from compound to compound sensitizing people. Most importantly, I think people started realizing what this virus is and that they need to report sick people to the hospital. And hopefully, while people were in their own homes, maybe, just maybe, for 24 hours, the Ebola virus was not being spread as actively. I think overall the day was a success. I think it showed that the citizens of Sierra Leone are serious about this and that they are ready to obey Presidential orders. I believe that many people were educated that day and I hope we start seeing some positive impact of that. Things need to start changing. Let's hope that this "Stay at Home Day" brought about some behavioral change!